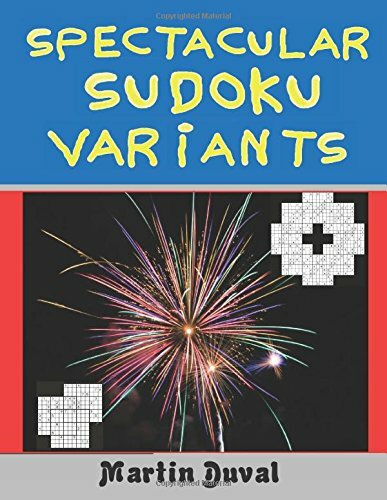 In order to continue our exploration of the Multi Sudoku mode, I present you two puzzles where each puzzle has 4 Sudoku. In the first puzzle, each Sudoku shares 2 regions with two different Sudokus. The next one where each Sudoku shares 4 regions with two other Sudokus. When four Sudokus together form a unique puzzle, we know that things are getting serious. I present you three puzzles in two different formats. The first one is a composition where each Sudoku shares two regions with two other Sudokus. The two other puzzles have the same shape however they are challenging and fun. The good new is that you can find these puzzles (and plenty of other of the same kind) in my book Spectacular Sudoku Variants. Be kind with yourshelf, buy this book and enjoy !. And the finaly the second one. I have presented the trio a Multi Sudoku of 3 Sudoku (Multi Sudoku with 3 Sudoku : The trio ) . Now I present you the Quatro, a Multi Sudoku with 4 Sudoku. The Sudoku could be interlaced in many ways giving many possible arrangements. First each Sudoku shares one region (box of 3x3) with two other Sudoku. Or each Sudoku shares 2 regions with two other Sudoku. Or each Sudoku shares a varable number of region with two or three other Sudoku.